Bushwalks, child/pet friendly, valley views, farm animals, wildlife, games room. The original 2 bedroom homestead, fire, a large verandah with spectacular views. The bathroom has been designed in a way that you can't escape the views of the blue gum foothills as you relax in your bath. A gas stove top, electric oven, refrigerator/freezer, all cooking utensils, pots, pans, plates and cutlery are there for your use in the refurbished kitchen. The queen-sized bedroom boasts valley bush views from the comfort of your bed. The cozy double bedroom is great for kids who want to sleep in while you enjoy some peace and quiet. All beds are fitted with electric blankets, all linen, a doona, and extra blankets for chillier nights that sometimes result in a beautiful dusting of snow during the months of May, June, and July. Winter brings our widest variety of travellers, all looking to enjoy the simplicities of a bush retreat, from the four bushwalks covering 16 kilometres of Highlands bush country, to a complimentary bottle of wine in front of the fire. A truly blissful respite from the demands of city living. Deb and Rob live on the farm and have spent the last twelve years refurbishing the old buildings on the property turning it into a place where people could come and immerse themselves in the majestic beauty of the surrounding landscape. At every opportunity we used local or recycled materials to reduce the environmental footprints of our endeavors, and added to the rustic charm of the cottages with our own design of mosaics of hand hewn slate, tile work and artworks that reflected elements, colors, and shapes of the surrounding landscape. Our previous experience of renovating and revitalizing old houses so that they could live a full and productive life was helpful with the challenge of Tanjenong whose buildings had been derelict for 35 years. They needed a lot of attention. The Shearers Cottage, aptly named, was the first to be rejuvenated. We fixed the leaky roof, added a covered verandah, put floors of locally hand-hewn slate tiles in the main room and front porch, internalized the bathroom, installed a fireplace, and re-plumbed. The original Kookaburra LPG gas stove was retained in the kitchen alcove, and a set of double french doors provided paddock views from the bed. A lovely warm and cozy nest for two. Blueslate Cottage, named for the new slate floors on the front porch and bathroom, was next. The original Homestead on the property, this building was abandoned for the house up on the main road in 1970. We added a wraparound covered verandah to help keep it cool, a new bathroom, a kitchen reno, and repairing the damage made by the previous tenants, wombats, birds and possums. Koorakai was originally a dilapidated machine shed, workshop and bunkhouse near the Blueslate that we decided to move to a beautiful valley and rebuild it from basalt stone, blue/green slate, recycled bricks, windows and doors, with a polished earthen floor and a stone fireplace. A large verandah overlooks a beautiful valley of paddock skirted by dense majestic bush. This property has been in Deb's family since 1971. It was purchased to start a family farming business with the hope that one day the goat track would be sealed and the spectacular beauty of the property could be shared with others. 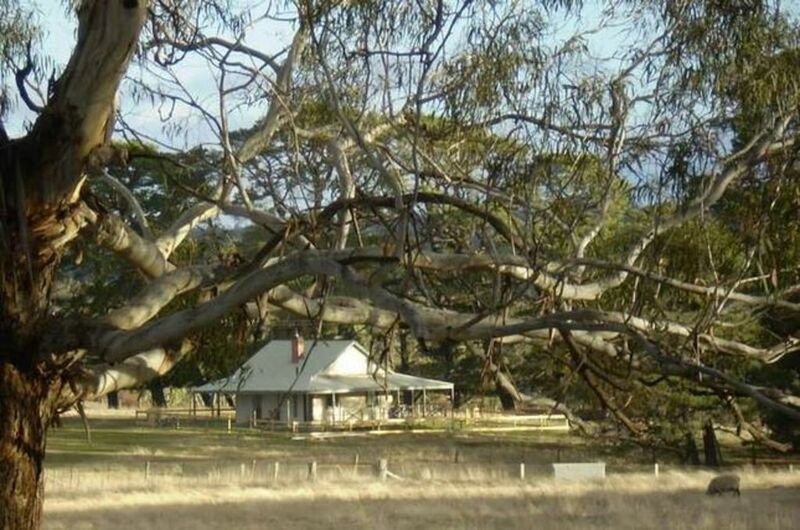 Weekends were spent here mustering sheep and cattle on horseback through the paddocks and bush and always represented a haven of great beauty and adventure for Deb and her five siblings. Today the road is sealed, but the adventure remains, and our visitors come to immerse themselves in the beauty that is Tanjenong, to get a small inkling of a simpler life on a farm on the edge of rugged wilderness, to get view of a real sunset, to breath in some of the cleanest air in the world, to fall asleep in the wintry months snuggled in bed dreaming of the first snow flake of the season, and to have Jack and Jill (our two donkeys) help unload the carrots from the back of the car. They aren't much good for anything else. The farm is a beautiful mix of paddock and bush. The fenced in cottage is in a paddock shared with sheep, alpacas, donkeys, and a goat..... all very friendly, and keen to help you eat your apples! Overlooking the 300 meter deep Abercrombie River Valley across to the foothills of the Blue Mountains, 2 of our 4 bush walks take you past beautiful views down into native bush and forest. This games room is available and contains the pool table, ping pong table and foozball game. There are 16 kms of bush walks on the property with one suitable for everyone. The Ridge walk, about 4 kms of flat walking, along a ridge through paddocks, overlooking the 300 meter deep Abercrombie River Valley. Spectacular views. The Cobodong/Horseshoe Walk, a medium difficulty walk with up to 4 to 6 kms of walking, one fairly steep decline down into a 100 meter deep valley with an easy walk back up along a creek via light bush and paddocks. Picnic spot half way along the route. Discover wildlife on this walk. The River walk is a challenging 6 kms walk with a steep decline into the 300 meter deep Abercrombie River Valley down a fire trail with a nice walk along the river to a picnic spot. Return via the same track back up the hill. We stayed at the Tanjenong property, in the Blueslate Cottage, Curraweela in NSW, for Christmas. We had such a fantastic few days and enjoyed the peace and tranqulity of the surrounding bushland and feeding the donkeys, sheep and goats. We enjoyed watching the kangaroos and birds. The cottage was cosy and quaint. A terrific homely property on a beautiful property. As the original farmowner's house the place felt like it had an enormous amount of history and stories to tell. It was very comfortable and cozy, with a stock of games, books and videos. The views from most of the windows were outstanding, and fantastic to wake up to. The property has four or five excellent, marked walks for getting a feel for the Southern Tablelands. Deb is a terrific hostess too (thank you Deb). The perfect place to bring your kids (or not) and unwind in an idyllic mountain farm setting. Rob and Deb are gold class hosts who really care about the land, and you. Well appointed, comfortable accommodation; friendly farm animals for the kids to run around with; miles of safe walking tracks; and stunning views. No wonder we keep returning! We loved the cottage, we loved the winter chill because it gave us a chance to have the fire going. We loved relaxing by the fire, watching old and not so old DVDs and there were plenty to choose from; (Muriel's wedding again). We loved the views from the cottage and a few frosty mornings. We loved the farm animals; donkeys, sheep, alpacas and we even saw a fox just a few metres from the cottage, (magpies chased it away). We loved the short trip to Taralga. We loved our adventure walk across the farm. We loved the cosy beds with electric blankets. Actually Blueslate Cottage made us love winter and we were sad when it was time to leave. Absolutely loved our stay at Blueslate cottage. Very clean, well equiped and cosy. Our girls loved the animals especially the very friendly donkeys. Bushwalks were well mapped out, kid and dog friendly (on a leash). Would love to return during the winter months. Thank you for an enjoyable stay. Ps very happy there was no phone or TV reception made for a relaxing weekend. Tanjenong Cottages are situated on a 1100 hectare working sheep farm at the southern end of the foothills of the Blue Mountains, overlooking the 300 meter deep Abercrombie River valley. The cottage paddock is actively used as pasture for a variety of farm animals. Sheep, Donkeys, Alpacas, Goats and Geese that roam free around the fenced in yard of your cottage. Lambs, Foals, and Kria are all in the paddock with their families. Early morning Eastern Grey Kangaroos, the occasional Swamp Wallaby, are often found feeding amongst the stock, with Wombats and Echidnas sometimes venturing out in the evening. A large variety of birds, including Wedge-tailed Eagles, Yellow-tailed Black Cockatoos, various Rosella and Parrots, and many of the smaller shrub-residing birds can all be seen on the farm, often from your verandah. We have 16 kms of bush walks that cross the property through paddocks and into surrounding bush on well marked trails are of varying difficulty and duration and all have sights to see. The Ridge Walk, a 90 minute return walk along the ridge of the property overlooking the full depth of the Abercrombie River Valley, is an easy walk through paddocks, with styles to help you cross fence lines. Two lookouts with benches for a rest and a chance to reflect on the beauty of the Australian landscape along the way, returning back along the same track to the cottage paddock. The Cobodong Walk, a two hour walk in total that drops down through paddocks and bush into a shallow 100m deep valley and follows a creek slowly back up to a couple of dams and a picnic spot, returning along the ridge above the valley back to the cottage paddock. The River Walk is a challenging three hour walk down 300 meters into the Abercrombie River Valley through a snow gum forest down a bush fire trail to a picnic spot beside the River. The return trip back up the hill is the challenge but is no trouble for walking enthusiasts. Taralga is a beautiful little village, with 3 pubs, 2 great little Restaurants, a small local Museum run by the local Historical society, 3 unique Gift Shops, an Art Gallery and an Old Wares shop. Lovely spot to spend a day exploring. The Ploughman Cafe serves delicious and innovative early morning breakfasts and lunches until 3pm, with great coffee in a lovely setting surrounded by beautiful art. The Tangled Vine is a warm and cozy place to have a more traditional meal with a very toasty fire, fast and friendly service, and great coffee. The Taralga Hotel and the Sports Bowling Club both serve traditional Aussie pub meals, big and tasty, with lots on tap.